Many widgets have specific attributes, however, they all share a set of the common attributes. Besides, all widgets can have the following children. Sets a tooltip text for the widget. The tooltip should always have the same text. The tooltip text should be translated according to the selected language. For the tooltip tag rich text formatting is always enabled. Attaches the widget to another one. When applied to several checkbox widgets, converts them into a group of radio buttons. A hslider / vslider can be attached to a label or an editline. 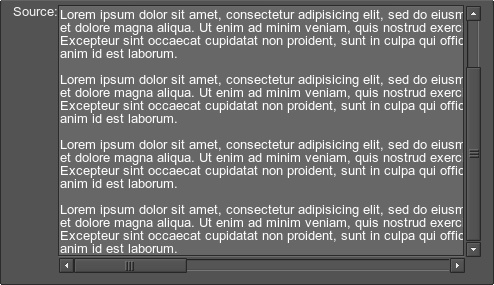 A spinbox can be attached to theeditline. The editline can be attached to the hslider /vslider and spinbox. This attribute takes a format string. A multiplier used to downscale values provided by the attached widget (integer). Indicates whether the minimum or maximum value of the attached widget can be changed by writing a lower or greater value respectively into the associated editline. Indicates whether the minimum value of the attached widget can be lowered by writing a lower value into the associated editline. Indicates whether the maximum value of the attached widget can be raised by writing a greater value into the associated editline. Sets a callback for the widget. Contains a name of the callback function. The widget has become visible. Supported by all widgets. The widget is removed from GUI layout (via Gui::removeChild()). Supported by all widgets. The widget has got focus. Supported by all widgets. The widget has lost focus. Supported by all widgets. The mouse pointer has run over the widget. Supported by all widgets. The mouse pointer has run out from the widget. Supported by all widgets. The widget is dragged and dropped over another widget. Callbacks of this type should be defined both for the widget being dragged and for the target widget. Supported by all widgets. The widget attribute sets a widget reference to be passed as an argument to the callback function. Any existing widget name is allowed. 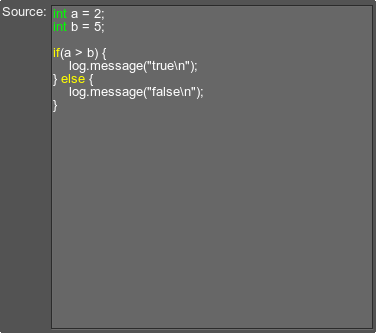 The string attribute sets a string argument for the callback function. Any valid string is acceptable. This attribute can also be used to pass any other data types. The variable attribute sets an argument of any variable type for the callback function. You can also pass vectors and maps. Any button, which has a corresponding ASCII code. Any of twelve functional buttons. Whether the CTRL button is pressed or not. Whether the ALT button is pressed or not. Whether the SHIFT button is pressed or not. Corresponds to an object of the WidgetButton class. Whether to render button background or not. The default is 1 (boolean). Whether the widget is a toggle button or an ordinary one. The default is 0 (boolean). Whether the toggle button is pressed by default or not. The default is 0 (boolean). Path to a button image texture. If no text is specified, the button will be automatically hidden. Corresponds to an object of the WidgetCanvas class. 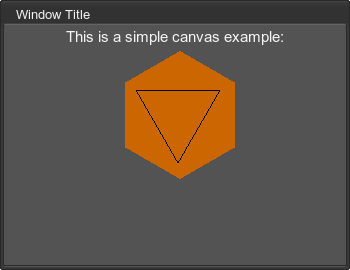 After a canvas widget was created, it can be used to draw polygons (either textured or not), lines and text via UnigineScript. The canvas can be used to create different trackers, charts, tables, etc. Corresponds to an object of the WidgetCheckBox class. Whether the checkbox is selected by default or not. The default is 0 (boolean). First checkbox widget of a radio button group. Corresponds to an object of the WidgetComboBox class. Path to a texture with mini-icons. This texture is a strip of N pixels in width and N×M pixels in height. texture, which sets the ID of a mini-icon to be used for the item starting from zero. data, which sets the item data. The data can be used as a text identifier of the item (instead of using the number of the item). Corresponds to an object of the WidgetEditLine class. Whether to allow modifying the text or not. The default is 1 (boolean). Whether the text should be displayed as dots. The default is 0 (boolean). Whether the widget has a background or not. The default is 1 (boolean). Maximum number of characters that can be entered (integer). Value validator, acceptable types are any, int, uint, float or ascii. Text color. Changes the text color only if the text tag is not specified as a child. If the child tag is specified, this attribute won't affect the text color. If there is no the text child, all of the text attributes can be defined as attributes of editline. The first editline allows user to input the integer values only. The other symbols are not allowed to be typed. 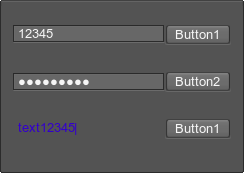 The text in the second editline is displayed as dots, because the password attribute is set to 1. The last editline has no background, and the text color is defined directly in the editline tag by using the color attribute. Corresponds to an object of the WidgetEditText class. If there is no the text child, all of the text attributes can be defined as attributes of edittext. Corresponds to an object of the WidgetScroll class. Width of the area to scroll (in pixels). The default is 100. Width of the visible frame (in pixels). The default is 10. Number of pixels to scroll, when the user clicks one of the arrows. The default is 1. Initial position of the scroller. Cannot exceed object-frame pixels. Corresponds to an object of the WidgetSlider class. Minimum value, up to which the slider's lower limit can be dropped (integer). The lower limit of the slider can be changed only via the editline, to which it is attached with the expand of min_expand flag. 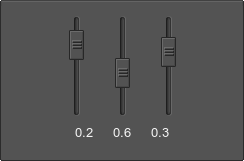 Maximum value, up to which the slider's upper limit can be raised (integer). 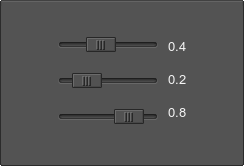 The upper limit of the slider can be changed only via the editline, to which it is attached with the expand of max_expand flag. Widget name, which will display the current value of the slider. Corresponds to an object of the WidgetSpacer class. Corresponds to an object of the WidgetIcon class. It is a square image, whose size is divisible by 2. For example, 16×16, 32×32, 64×64. Each icon has 4 states. For more details, see the article on Skin Layout. Whether the icon serving as a toggle button is pressed by default or not. The default is 0 (boolean). Path to an icon image. The icon capture. The acceptable attributes are left, right, center. Corresponds to an object of the WidgetLabel class. The label widget can have any of the common attributes. This tag can be omitted. In this case, all the text formatting attributes can be specified as attributes of the label. Corresponds to an object of the WidgetListBox class. Whether to allow picking more than one item or not. CTRL and SHIFT modifiers are used for multiple selection. Path to a listbox texture of mini-icons. This texture is a bar of N pixels in width and N×M pixels in height. Corresponds to an object of the WidgetMenuBar class. Specifies whether the item is enabled (i.e. you can interact with this item). By default, the item is enabled. Sets a space between the current item and the next item located to the right. Title of a menu item. If you set a color, font size or any other text attribute for the item, this attribute value will be applied for all menu items on the current level. The attributes below are applied for each item separately. Dropdown menu that opens when clicking the menu item. Corresponds to an object of the WidgetMenuBox class. By using this widget, you can create hierarchical menus. Also you can use the other widgets or containers as menu items. Path to a menubox texture of mini-icons. This texture is a strip of N pixels in width and N×M pixels in height. Text of a menu item. Multiple items are supported. Specifies whether the item can be selected (i.e. the item is highlighted when you point to it). By default, the item is selectable. Specifies whether the item is followed by a separator. Sets a space between the current menu item and the next item (pixels). A single menu. It describes a menu item, its tooltip and a cascading menu that opens when clicking this menu item. Multiple menus are supported. Cascading menu that opens when clicking the menu item. Tooltip for the menu item. A single widget or a container that is used as a menu item. The attributes used for the text tag are also appropriate forwidget. Specifies whether the item can be selected. By default, the item is enabled. Corresponds to an object of the WidgetSpinBox class. Minimum value, up to which the lower limit of the spinbox can be dropped (integer). The lower limit of the spinbox can be changed only via the editline, to which it is attached with the expand of min_expand flag (integer). Maximum value, up to which the upper limit of the spinbox can be raised (integer). The upper limit of the spinbox can be changed only via the editline, to which it is attached with the expand of max_expand flag (integer). Widget name, which will display the current value of the spinbox. A spinbox automatically aligns with a text field it is attached to, if both of them are children of the same immediate parent, and if the spinbox has the overlap alignment flag. Corresponds to an object of the WidgetSprite class. Sprite is an image composed of several layers that can be assigned textures, scaled, translated and colored. Modulation color of the first layer. Path to a texture of the first layer. Scale factor for the first layer. Scale factor for the first layer (by x). Scale factor for the first layer (by y). Offset for the first layer. Offset for the first layer (by x). Offset for the first layer (by y). The X coordinate of the upper left corner of the texture for the first (bottom) layer of the sprite. The Y coordinate of the upper left corner of the texture for the first (bottom) layer of the sprite. The X coordinate of the lower right corner of the texture for the first (bottom) layer of the sprite. The Y coordinate of the lower right corner of the texture for the first (bottom) layer of the sprite. Path to the texture of the layer. Corresponds to an object of the WidgetTreeBox class. Whether to allow modifying the hierarchy of items or not. The hierarchy can be modified by dragging items with ALT pressed. Path to a treebox texture of mini-icons. This texture is a bar of N pixels in width and N×M pixels in height. Specifies a parent item for the current one. The text of the parent item must be specified. Height of the area to scroll (in pixels). The default is 100. Height of the visible frame (in pixels). The default is 10. Widget name, which will display the current value.